Move over David Beckham, there is a new record holder in town, and his name is Kaka. When the 2015 MLS season gets underway in January, Kaka will be the highest paid player to have ever played in the MLS, surpassing the former LA Galaxy midfielder David Beckham. According to the numbers released by the players union, the 32 year old Brazilian midfielder will earn $7.2 million playing for the new MLS franchise, Orlando City. The team has invested in their new designated player to be not only the marketing face of the team but to also help them as they make the move into MLS from USL. A risk but a calculated risk that could see huge dividends off the field, but that won’t be enough to offset the investment made in the player. The previous record holder was David Beckham that played for the LA Galaxy and was the main reason the designated payer rule was introduced. He was earning in Los Angeles a reported $6.5 million a year, a bit less than what Kaka will be making. For a league that currently has Thierry Henry as one of the stars and will see Frank Lampard and David Villa play for the new MLS team in New York, the NY City FC, this is an incredible salary, and an even bigger statement, considering it surpasses the Beckham numbers, which most didn’t think would ever happen. 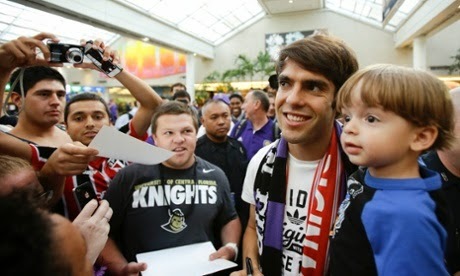 I always figured that it would take a very large sum to bring Kaka to MLS but I didn’t think it would surpass Beckham. At some point in time someone would surpass Beckham, that is something I always realized, but I didn’t think it would be Kaka, specially playing for Orlando City.